​I am fascinated by dragonflies, damsels and libelles. Call them what you will. I love to watch these iridescent little helicopters with their filigree wings dart among lilies by waterside locations. To me they really represent summer's halcyon days. This breezy range is great for lovely camp crafts too! The COMBO includes the 3D SUMMER CUP and the SUMMER TEACUP CRADLE CARD that both feature the DRAGONFLIES and LILIES design! These versatile and summery Dragonflies n Lilies ranges are perfect for birthdays, friendship tokens and summer crafting. Mix-and-match coordinated crafting. Also use the printables from this set – like the backgrounds, packet and small envelope – for scrapbooking and the custom journal set for momentoes and hidden thoughts. There's a pretty, summery, dragonfly card collection with cards and postcards to print and send. Stay-in-touch summer cards for all ages all summer long. This breezy card set is great for many different occasions. Perfect for birthdays, friendship tokens and summer crafting. Use the journal printables to transform a cheap note book or hardcover journal. You can add the odd photo too, but the elements are essentially for your inspired thoughts and writing. Or use the frames and elements for regular scrap booking. You can also cut the pages smaller. A background/cover page can also be written on or used as gift wrap. The dimensional layered card is perfect to celebrate summer, friendship and birthdays. Embellish with the 3D elements provided. There is also a bookmark for summer reading – enclose it as a special gift. Add other embellishments like ribbon in a contrast colour if you wish. 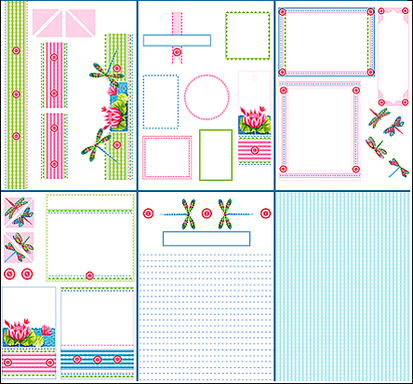 20 Pages of line art in two designs, two line thicknesses and 10 sizes. 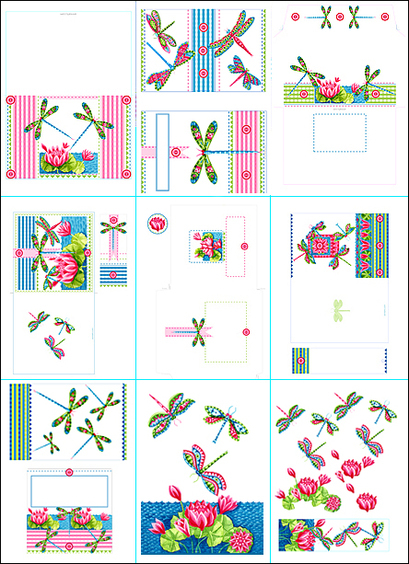 Dragonfly pictures in line art for digital stamping, fabric painting, glass, decorative tole and porcelain painting, embroidery or coloring-in for kids. They can color the pages with the thick line drawings with felt markers for pics with a stained-glass effect. I included the thick lined drawings for tracing through light fabric. I used the smallest size to paint on a white cup and the biggest size to paint a cushion. The design will look great on jeans, bedlinen and tea towels too. Just add beads, buttons, ribbon and rickrack for the Anni Arts look. 5"x 7"/17.5 cm x 12.5 cm card plus a separate page with elements to cut out for layers plus a bookmark. Sized for Paint Crafts, Fabric Painting, Coloring-In and Porcelain Painting. Do you like the Dragonflies and Lilies? Should I add items? CONNECT WITH ANNI ARTS CRAFTS!